Phew! What a crazy few days I've been having. 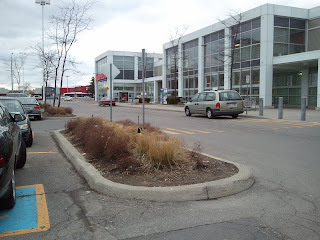 I almost forgot about this little ol' blog of mine. Just thought I'd blog about 2 related things and 1 completely unrelated thing to get me back into the swing of things. 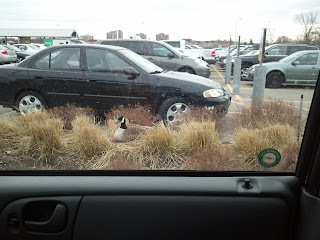 Knolan and I went grocery shopping one morning at Superstore and on our way in we saw a nesting Canada Goose who had settled in for the long haul right on a parking lot median. Yikes! Not really where I would picture myself having my kids, but then again, I'm not a goose. We kept a wide berth as her hubby was standing guard about a metre away from her, giving anyone walking by a hard time. When we came back that afternoon to show Kaycie the goose, and for something I'd forgotten (story of my life! ), I took some pictures. This time, hubby was gone, but she had some new friends... a mallard duck couple! 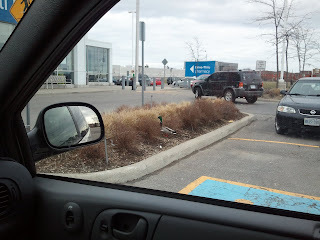 I just thought this was soooo interesting that this was all transpiring in a bustling parking lot! It kind of reminds me of this tree that my mom once noticed in Toronto. It was a giant pine tree growing in the postage stamp sized front yard of a home near mid-town... the only tree on the street. My mom loved it and said it made her think the tree was sticking it to the man and not letting the city get the best of it (or something like that). It's hard to see, but both the male and female mallards are in this picture and Mama Goose is at the far end of the median. So... 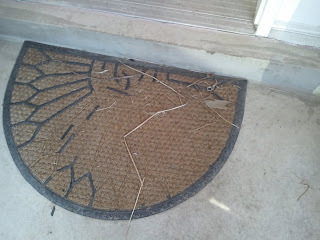 I'd been coming home for a few days wondering why my front porch was such a mess of twigs and straw. I honestly started to wonder if some neighbourhood kids were playing an extremely lame prank on me. Then as I got to the door and fumbled for my keys, I looked at the doormat and thought, "What the heck is going on!?" 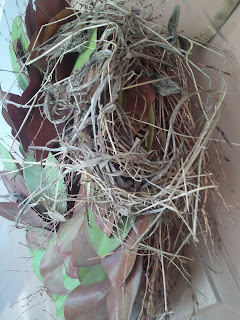 Then I looked up at my wreath, and it all made sense to me... a nest!!! In fact, I jumped when I realized what it was. Last spring, a robin made its nest in our climbing vine outside our front door, and we were daily dive bombed by a very protective mama bird! 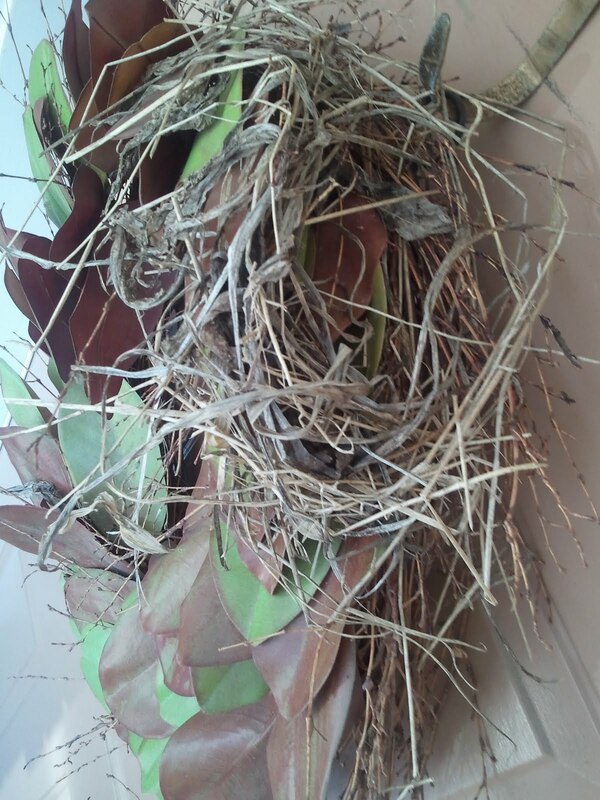 Sadly, our climbing vine got some sort of disease, and so Ken took it down... resulting in the robin relocating! After I jumped and then ducked and then looked around, I got up the nerve to look inside the nest. Which, I must say, is weirdly positioned. Why wouldn't the bird build the next in the middle of the wreath? I totally would! Phew! My head was likely safe for the moment. 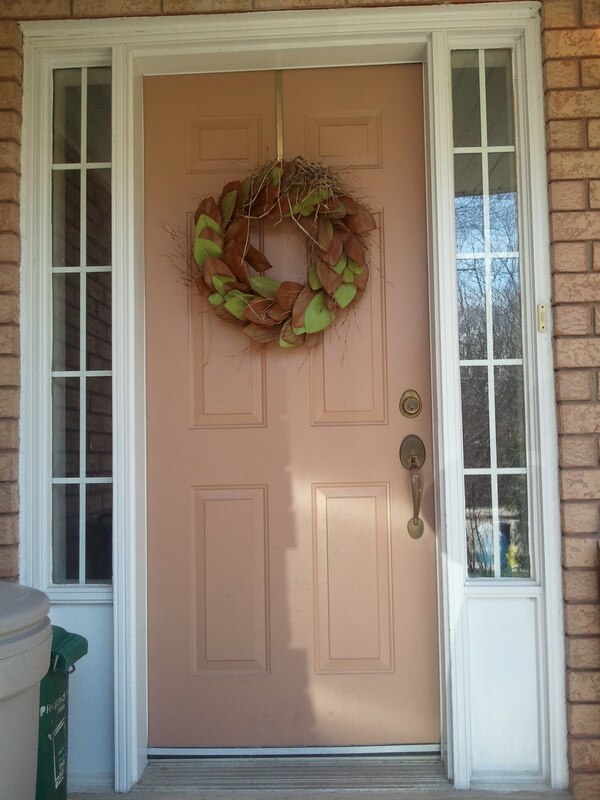 I opened the door, only to realize that our door opens INTO our house. Oh no... this was not good. Every day for weeks I'd be opening the door and running for cover, hoping the robin wasn't going to follow me and the kids inside, pecking at our heads! When Ken got home, we talked it over, and decided that we'd move the wreath over to the trellis... it would be easy enough to just hang it there with the hook, and maybe the robin would remember her old home sweet home. So, Ken moved it and we hoped for the best. Unfortunately, the robin either couldn't find her nest, or she just decided she didn't like us relocating her nest. 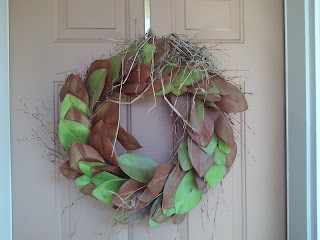 She didn't come back, so Ken dismantled the nest and hung our wreath back up on the door. Now I'm having guilt. I feel so bad! But, no sense crying over spilled milk... We were trying to do the right thing, but now it's done, and hopefully the robin was able to make a new nest in time. I like to take Pink's advice when it comes to dinner out sometimes: Don't get fancy. So, Denny's it was! "your.... birth... day... Today is MY birthday!!!" "with... a... Gra... Grape? What is it?!!" "Grand... Slam... OK... maybe I will." At this point Ken was openly mocking my complete elation at discovering that birthday boys and girls could have a Grand Slam breakfast for free. And he was also mocking me for even entertaining the idea that Denny's would be giving out free grapes to people on their birthday. - Watching Kaycie's face go from smiles to horror and back to smiles as the hostess pretends that Knolan's name is Phil, and that she is going to take him home with her... she thankfully figured out that it was just a joke fairly quickly. - Listening to Kaycie order her drink: "I would like an orange juice shaped like a basketball." - Watching Kenny carefully colour with each free Denny's crayon on a precise angle until eventually they were all sharp and pointy, at which point he holds them up for me to see and says, "I'm ready for prison now. Shivs!" - Listening to Kaycie basically tell off the hostess who came back to remind Kaycie that Knolan was going home with her and not with us. Kaycie concluding argument was soundly based on eye colour - she informed the hostess that since she had black eyes and that Knolan did not, that he was, in fact, Kaycie's brother, and not the hostess's. - Trying explain to Kaycie why you shouldn't tell your server about the "giant, huge boogie" that you pulled out of your nose just moments before she arrived. I tried to create a teachable moment by role playing with her. I would come up with scenarios like: "If you had a big toot at home earlier, can you talk about that at dinner, or is it too gross?" and she would have to pick the right answer. She did pretty good until I said, "If you petted a really cute kitten today, could you talk about that at dinner, or is it too gross?" and she said, "Well... what if I petted a really cute kitten until it made a really big toot?" It is hard trying to explain this stuff to kids!! - Watching Knolan basically fall face first onto the table and fall asleep while we were paying the bill. That was our cue to exit stage left and get the kiddos home to bed. Poor guy! I swear he was wide awake just moments before. Anyway... that's it for today. Off I go to bed for my 4.5 hours of sleep until I get up to watch Kate and Wills tie the knot.